Saturday, 11/12. 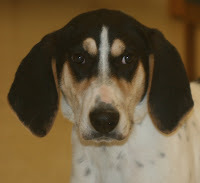 A male Hound mix, about 5 months old, with a handsome short-haired coat that's mostly white and black with a little tan. He was found at the intersection of Sherwood Road and County Road K by a hunter in the area for the weekend. He's a very friendly guy who wants to go home! !